Arrival in Santos was during a very overcast, cloudy morning, but again hot and humid. The approach was past hilly islands and lots of container ships. No excursion booked today so we were on our own. 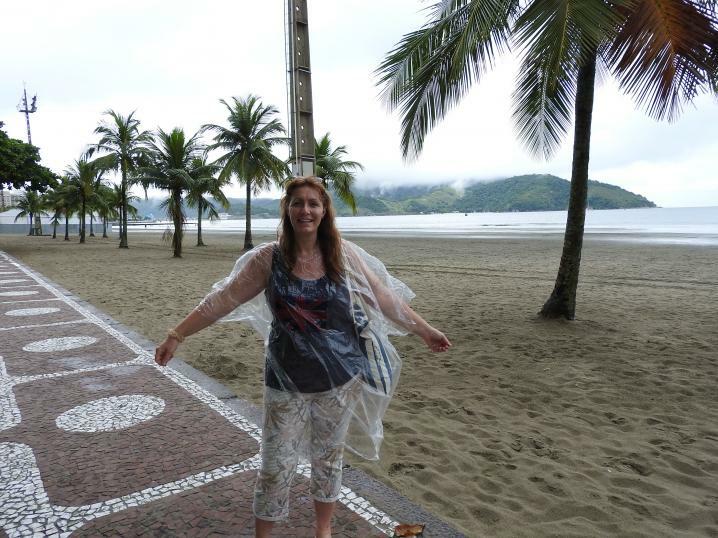 The recommendation on the programme and over the PA when we are in Brazil is to take water, insect repellent, sunscreen and a light rain mac with you when you go ashore. Plus, to leave any unnecessary valuables on the ship and make sure your bag is securely fastened and cameras are well secured on your person. There was a shuttle bus that took us into the city. We were given a map in the port terminal but didn't know where the shuttle was going to drop us until we got there, so we followed the route it took on the map to check where we were. We were probably on the third or fourth shuttle bus and they were going about every 20 minutes. It was raining slightly when we boarded the coach and it got heavier as we got closer to our destination. We were dropped just outside a modern shopping mall (about half the size of The Mall at Cribbs Causeway), and as as we got off a crowd of people came towards the coach to get on - it was passengers from the ship that were going back to the ship because it was raining. All they had done was walk around the shopping mall and that was going to be the extent of their 'sightseeing' in Santos! We went inside and it was lovely; 4 floors, loads of shops, Starbucks cafe, huge sculpture in the middle and toilets which Martin checked out, but we didn't stay and look around the mall as the rain had just about stopped. The shopping mall was marked on the map and we could see the beach wasn't far so we walked in a straight line out of the mall through residential streets for about 15 minutes to get to the beach. It started to rain again just as we got to the Beach Gardens and I put on my 'light rain mac' which was one of those plastic bag affairs with a Union Jack flag on the front (Martin would rather get wet!). The beach gardens are in the Guinness Book of Records as the longest beach gardens in the world - this is a narrow park between the beach and the road which has winding paths amongst the flower beds and trees giving shelter from the sun - or today, the rain. The beach was reminiscent of Copacabana, having children's play areas and exercise stations dotted along the beach. There were also several temporary pavilions because of the carnival period and one pavilion for the Police force complete with quad bikes for zipping along the sand. The beach was virtually empty but we walked through the gardens and over the narrow 'canals' which transected the peninsula that we were on. We saw a group of umbrellas and sun beds set out on the beach in the distance which was probably the 'Beach Excursion' from the ship - it looked like there was a large group sitting in the nearest beach cafe - I can only imagine the complaints that were going to be flying around. One because of the rain and two because they could have walked to beach from the drop off point at the Mall like we did (they had paid £25.00 each for the excursion). After about an hour we stopped at one of the beach cafes and had lunch. We pointed to pictures of items on the menu and thought we had ordered fruit juice and burgers. Fruit juice came and was lovely, just like freshly squeezed orange juice. Two plates of food came that looked like a heap of noodles, but turned out to be an open burger bun at the base, piled high with chicken, onions, peppers, sweet corn and cheese, then covered in tiny crisp potato chipsticks, smaller than matches. It was very nice! We were the only people in the cafe, sat outside under the rain canopy. The chef came over to take our payment and tried to talk to us, but as we didn't know any Portuguese it was difficult. He was very smiley and called the waitress over who gave us each a large sweet that looked like a truffle - it was but with a soft caramel centre, that was very nice too! He shook our hands and we said thank you 'obrigado'. The rain had stopped as we left the cafe but started again before we got back to the shopping mall. I had abandoned my light rain mac as the condensation inside it was getting me as wet as the rain would have, so we both sheltered as best we could under my umbrella. Back at the ship we saw some of the provisions being loaded - piles of sacks of potatoes, boxes of fruit, huge pallets of bottled water (the water from the taps on the ship was drinkable) and cans of Coke. We were due to sail away soon so what we saw was just the tail end of the supplies! That evening we had the Passenger Talent Show eight participants. It was mainly singing, recitals and a piano player. All of them were reasonably good. One guy sang a song he wrote that had been on the 'B' side of a top ten hit in the sixties, one sang a couple of Northern 'ditties', another did shortened versions of a couple of Scottish poems (so Scottish it sounded foreign), and another sang Scottish ditties. One lady read a poem she had written about life on the ship - Pam Ayres style, another lady (Wynn, 94) read some of her late sister's (104) poems and jokes and sang Ave Maria, the next lady sang Evergreen & Don't Cry for Me Argentina, and the last lady played a couple of shortened classical pieces on the piano. The programme sheet for today gave some facts about a typical 14 night cruise on the Marco Polo - that 21,000 pieces of bed linen are laundered, 2,240 towels, 1,680 crew uniforms and 24,640 tablecloths and napkins and 420 articles of guest clothing (quadruple those figures for our cruise). So the 6 industrial washing machines and 7 dryers are well used. There is no passenger laundrette on this ship so if you do not want to pay for your laundry then you have to do it yourself in the cabin. Typical laundry costs are t-shirt/shirt £1.85, trousers £3.75, shorts £2.00, jumper £2.75, underwear £1.00. Prices include ironing, and there is also an ironing service if you want items pressed from being creased in suitcase, or if you have washed them yourself, but the prices are only a little less i.e. t-shirt/shirt £1.60. So far I've had one of my posh dresses ironed, and my white denim cropped trousers washed and ironed. There is a small washing line less than 1m (3ft) across the shower and I had brought pegs and travel wash with me, so I could at least do our underwear, but have managed everything else as well. The shower room (and cabin) is constantly ventilated/air conditioned and most things dry in less than 24 hours - t-shirts and shorts are put on hangers and hung from superb little magnetic hooks that Sam and Laurie got for us for Christmas. As the cabin is panelled with metal walls and ceilings they can go anywhere and have been amazingly useful! This afternoon there was a passenger lecture by Peter & Ann Hunt - Around the world in 80 days Millennium Motor Challenge. A rally of vintage cars (pre 1969) to celebrate the year 2000. This couple had never rallied before and had an old Austin Healy car prepared for this round the world rally, which they used to raised money for their local children's charity at the same time. The photos and commentary were excellent as they talked about what happened on their way from London to Beijing across Europe, Russia and the Middle East. Tonight's show was 'On Broadway' with several songs from Broadway Shows.